I’ve recently had the privilege of reading a wonderful book, ahead of its release last week. There’ll be a review to follow this Friday (and, of course, a giveaway! ), so I won’t reveal too much yet, but suffice to say the book is called ‘Catching Contentment’, and the title caught my attention because how many of us, if we are honest, genuinely feel at peace, wholly contented and satisfied with life all the time? I often wonder whether this lack of contentment is one of the contributing factors towards the increasing prevalence of stress and anxiety in our culture – it certainly seems to be one of the symptoms. So what does the Bible have to offer? 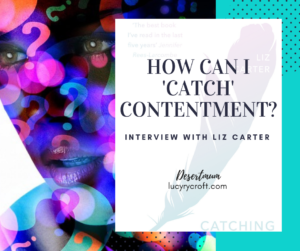 To share her thoughts, it’s my honour to welcome to Desertmum the author of ‘Catching Contentment’, Liz Carter. Hi Liz, it’s great to welcome you to Desertmum! Tell us a bit about yourself. I’m a mum of two teens, married to a Church of England vicar. I’ve struggled with lung disease since babyhood, and I write out of that experience, trying to make sense of a messy and broken experience of life. Apart from all that, I love reading, turquoise and Cadbury’s. How did ‘Catching Contentment’ come about? I’d not thought a lot about contentment until a few years ago, because it seemed like a word which couldn’t apply to my situation. I’d thought contentment was for people who had everything together, who were healthy and happy. But after being asked to lead a seminar about contentment at New Wine, I looked into what the Bible said about it, particularly concentrating on the apostle Paul’s intriguing statement that he had found the secret to being content in every situation (Philippians 4:12). When I looked at his life, I realised that he couldn’t possibly be talking about contentment as society tells us, because he lived in hardship and pain. He was writing these words while in prison, with a threat of execution hanging over him. Digging into his words began a journey of discovery about a different – and much more powerful and profound – meaning of contentment. While there are many joys of becoming a parent, many of us also feel a certain amount of discontentment. Perhaps we are not able to follow our careers in the way we did before having kids. Perhaps we’re financially wobbly. Perhaps we are feeling helpless to know how to raise our kids. What advice do you have for those of us who are struggling with contentment right now? I think that so many of us tell ourselves that we are not quite good enough. We think that we should be more perfect than we are, and we beat ourselves up when we don’t reach that impossible standard. Social media can be unhelpful here – we look at snapshots of other families’ lives and decide that our own don’t quite match up. I’ve spent so many school holidays racked with guilt because I haven’t been able to take my children out on daily adventures and fill their lives with wonderful experiences. I’ve been sat at home under my blanket, believing that I am lesser. Paul talked about ‘peace beyond understanding’ – a peace that doesn’t come because things are good, but because God is good and God is peace. I’ve found that it’s in my darkest times, my deepest pain, that God breaks through with this peace which doesn’t make sense but fills me with the riches of hope in Christ. Something I wondered as I read the book – and a point you make too at one point – was whether it’s ‘easier’ to seek contentment in Christ when life is tough. When life is going well, there are so many other things we can lean back into. What are your thoughts on this? I think it’s true that we can become complacent when things are going well. Somehow, when the edge is taken off, we often forget to seek Jesus with the passion and desperation we might seek him with when things are darker. One day we realise that we are feeling a little off, a bit discontented, and we can’t quite pinpoint why. I think that when we look to Jesus, we discover what we have been missing all along. But sometimes we forget to look for him, even to glance in his direction. Sometimes we live our lives as if Jesus isn’t nearby. I know that I’ve done this, and I know that those are the times I have slipped into bitterness. It’s also true that in my darker times I’ve somehow found that contentment is nearer, or at least the contentment which Paul wrote of, which doesn’t actually look like contentment as the world might think of it – lying on a beach in the sunshine, or curling up by the fire on a chilly day. It can look much more like living with brokenness and finding treasure within the desperate moments, because we dig further into the riches of who God is when we live with sharp edges. The challenge is, of course, to keep hold of that sense of God’s presence and peace through our good times as well as bad, and vice versa. For me, your book just got better and better the more I read! I love your wisdom, and felt deeply challenged to seek Christ first above everything/everyone else in my life. But a highlight was chapter 11, where you talk about darkness (ironic, that this was my highlight!). Up till this point, contentment – even in Christ – could be interpreted as something tangible, but now you start writing about those times of darkness, when we can’t really feel God is there with us, drawing us towards him. What have you learnt from your own dark periods? Chapter 11 was actually the most challenging chapter to write, because everything in me wanted to give solutions to the problem of the ‘dark night’ where we can’t seem to access the presence of God. Yet approaching it like this seemed to rid the issue of any nuance, and flatten out the raw reality of what it is like to go through this kind of thing. So I ditched the solution version and instead delved further into the cry of the Psalmists and the stark picture of Jesus on the cross, shrouded in the deepest darkness we could possibly imagine, because in my own dark times I have found that remembering this astonishing sacrifice has sustained me, reminding me of the love that never leaves me. I’ve also learned that although these times are incredibly painful, I always grow through them, in faith and character, and find that God is somehow widened out for me rather than narrowed by them. Finally, with Christmas drawing near (I can mention that now Bonfire Night is out of the way, right?! ), and the many stresses this season can bring to families, do you have any words of wisdom for how we can seek our contentment in Christ, amidst the many distractions? This time of year can pile on so much pressure, financially and otherwise. We so often feel we should be making it a time of perfection, just like in those John Lewis TV ads, with our children starry eyed and sparkly, our homes free of arguments and full of beautifully placed decorations, our tables laden with a feast even Delia Smith herself would be impressed by. In all of the rush to be flawless, we sometimes forget to remember that Jesus was born into great imperfection and weakness. Let’s try to find time in the busy season of Advent to gaze upon the Christ child in all his frailty, to find our meaning in who he is and all he has done, to throw off the heavy burdens we place on ourselves. Let’s liberate ourselves from the comparison that can be so weighty on us, and dance into the freedom of being real, of sharing our pain and our brokenness instead of putting on our masks and living Instagram-ready lives. And don’t forget to check out the video trailer here. Enjoyed this? Why not read some of my other reviews? Pingback: Catching contentment – review and GIVEAWAY! Thanks for sharing this new book Lucy. It sounds wonderful and so encouraging. Can’t wait to read it!